Request 1 or more pac color choice here. This small carved mountain lion is carved out of serpentine and has an pen shell arrowhead pac. It also has some light etching designs throughout its body. It measures approximately 1 1/2" wide 1/2" tall and just under 1/2" thick. 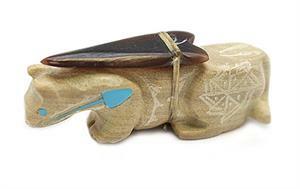 It is Zuni hand carved by Adrian Cachini. Also available with pink shell arrowhead pac. Choose color of pac when ordering.